The truth and power of God’s Word comes vividly to life in a high-quality, full-colour, graphic-novel style New Testament that is ideal for today’s visually focused culture. 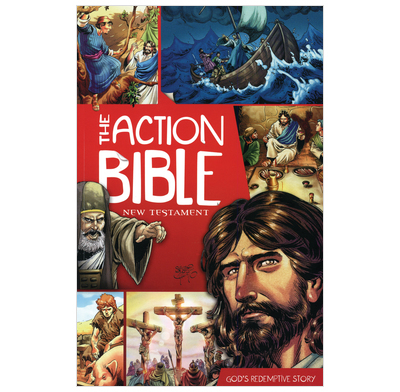 In this New Testament edition of the bestselling 'The Action Bible', kids ages 9 to 12, and adults who love graphic novels, encounter scripture in a fresh way as the people, events, and emotions it shares are visualised in 67 New Testament stories. Sergio Cariello offers years of talent and expertise as a graphic novel illustrator for top comic book companies to create contemporary art that speaks to children today. And careful attention to scriptural accuracy ensures a complete and trustworthy biblical overview. It provides a meaningful way for parents, grandparents, teachers, and church ministries to spark a connection with and love for God’s Word. This is a beautifully illustrated book, and the trailer for it was great so I bought it, either as a present or to use as an occasional aid in teaching at church. However, I haven't felt able to use it for either of these things. This is because sometimes it 'translates' the bible in ways that unhelpfully add to/ soften the text. For instance, when Jonah is on the ship running away from God (ch 1) the book narrative shows him praying & apologising to God for not going to Ninevah. Whereas in the bible text, one of the striking things is that Jonah isn't recorded as speaking to God at all until he ends up right at the bottom of the sea. Again, in the narrative to accompany 2 Sam 11, it records David seeing Bathsheba and thinking 'If only I could marry her' and then sending Uriah off to war so he could 'marry' her. I appreciate the desire to keep inappropriate details from children but it softens what David actually did - which was not out of any desire to 'marry' Bathsheba, since in 11:8 he clearly just wants to cover up his own sin. I appreciate it's very difficult to write non-biblical narrative that doesn't subtly change God's word, but these points seem glaring to me and so I think the narrative leaves much to be desired. I'm afraid this has the potential to give young people a softened and inaccurate impression of some very powerful bible stories. I have to add, I haven;t read it from cover to cover and so there may be parts of it which are summarised beautifully, I've just picked out the parts which I didn't like. I find it very difficult to find books with bible stories for boys from age 9 years to about 14 years, but this was an ideal choice.